Conveyancing software provider Hoowla has introduced automatic property search alerts into their case management software to help customers make informed decisions when ordering property searches. Using data provided by the coal authority, the first of Hoowla’s search alerts determines whether the property being purchased falls within an area which could be affected by coal mining. The property is clearly marked on a map along with the boundaries of known coal mining areas and an alert to order a CON29M is prominently displayed if the property falls within the boundary. Customers can order property searches directly through Hoowla and fulfilled orders are automatically returned by the search provider into the case ready to be downloaded and shared. Customers using one of Hoowla’s integrated conveyancing search partners (while it’s not a requirement) benefit from a seamless and hassle free search ordering experience. Hoowla is partnering with an ever-growing number of search providers, the most recent being Quantus Conveyancing Support Services. Hoowla, the recognised alternative to the Law Society’s Veyo platform, is modernising conveyancing for law firms and is a growing software provider for the legal industry. 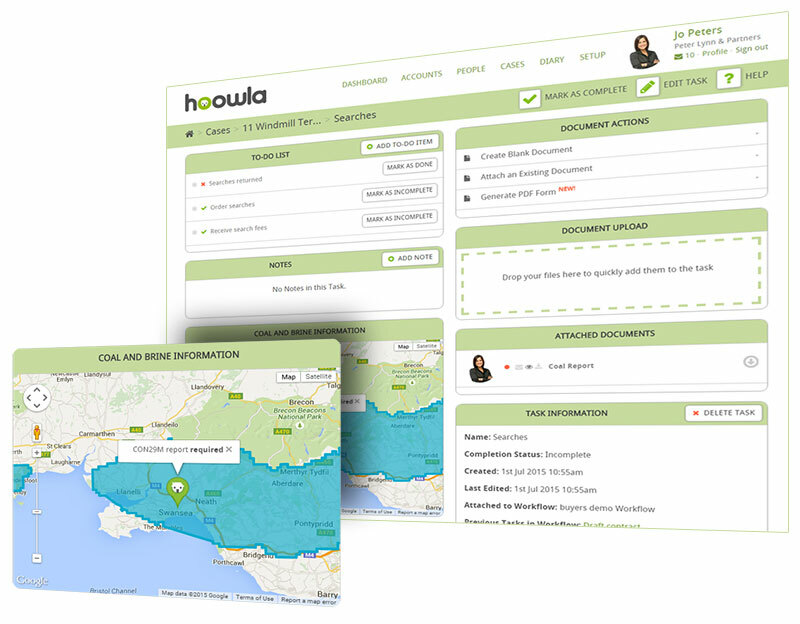 Developed in the UK and using the latest cloud technology, Hoowla promotes a modern approach to legal software that includes full accounts and invoicing, precedents and letters, search ordering, online SDLT submissions, Land Registry Integration, practice performance reporting and more. Hoowla offers 24 hour support and works closely with customers, quickly integrating feature requests into the system at no extra cost. For more information on Hoowla call 01792 687146 or email tom@hoowla.com.